Firearms on this page are separated into Handguns, then Long Guns. They are listed alphabetically by manufacturer. Click on the picture to view the Full-Size Photo. Additional photos are available on request. 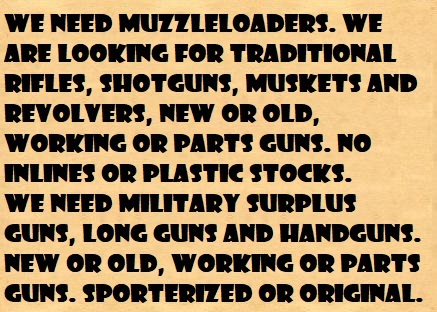 *Blackpowder Firearms can be shipped directly to the buyer in most States. UBERTI Remington 1858 New Army Target Carbine 44 Caliber Uberti Remington 1858 New Army Target Carbine Single Action Percussion Rifle, with 18" octagon barrel, blue steel, 6-round cylinder, fixed sights, brass triggerguard and buttplate, two-piece walnut grips, gun is new in box. No returns on new guns covered by factory warranty. This is a blackpowder firearm and can be shipped directly to the buyer in most states.